I am often asked by young adult cancer patients how to best go about writing and publishing a book. The answer is complex and calls for a series of posts. Many changes have happened in the last two decades in publishing, both constricting and expanding the possibilities for getting your words in print. Massive conglomeratization has occurred in the publishing world – the 200 some major presses that dotted the publishing terrain have merged or been bought out. They have become imprints of the big giants, leaving about twelve big-players. At the same time, self-publishing has blossomed, putting more DIY book publishing power in the hands of the people. Donald A. Wilhelm is the author of This Time’s a Charm; Lessons of a Four-Time Cancer Survivor. I asked him to write the following post on why he chose to self-publish his book. 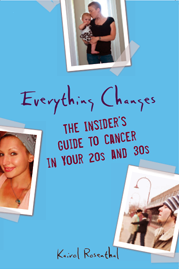 In subsequent ‘Should You Write A Cancer Book?’ posts, I’ll walk you through the steps I took to get my book Everything Changes published, outlining the pros and cons of getting published by a large sized publishing house. We’ll also hear from author and editors who work with small and mid-sized presses and university presses. After beating cancer, you are approached quite regularly, by friends or family members, to give advice to a third person that has recently been diagnosed. It’s an honor, a privilege and a duty to do so. But something always bugged me about giving advice to the newly diagnosed. The quantity and quality of advice I could give was limited by the amount of time I could spend with that person and the rate at which they could absorb the information I was giving them. But then one day it hit me. ‘Hey, I SHOULD write a book!’ I could write out all the experiences I have had in my cancer career and include the advice I would normally give. That way everyone would receive the same quantity of advice and could absorb it at their own rate. So Presto-Change-O…I was a writer. Let me pause by admitting that when I started this process, I simply had no idea what was involved in writing a book. But I started anyway. Part of my “book time” was reserved for actually writing, while the rest of it was dedicated to reading other books about writing & publishing. It took more than five years for me to complete the book from the time I first realized that I needed to. In my particular case, it took this long because I had 3 subsequent cancer relapses followed by chemo, radiation and eventually a stem cell transplant. So my writing journey kept being interrupted. I think looking back, that if I just sat down to write a book about a topic I was well versed in, it should take only about a year to do so. And that’s assuming you have a day job to keep up with as well. The most difficult part of writing for me was the constant grind each day of ‘having to write.’ Even though I only wrote for 45 minutes a day, doing that for more than a year can really wear on you. Additionally, my most creative time of the day is somewhere between 2-5p.m. But given that I have to work a ‘regular job’ like most of you, I had to force myself to get creative first thing in the morning. Writing at 7a.m. for me was not easy. I also spent about a year studying the different ways to actually publish a book. I investigated traditional publishing houses, traditionally self-publishing and so-called ‘Print on Demand.’ Ultimately I chose a company called BookSurge to publish my book. It was the right solution for me and I’m very happy with my results. I would recommend self-publishing to most people and suggest that you start your research by reading: The Self-Publishing Manual, How to Write, Print & Sell Your Own Book by Dan Poynter and The Well-Fed Self-Publisher by Peter Bowerman. • I didn’t want to give up control of the content of my book. My message was going to be clear, concise and occasionally filled with raw emotion. Nobody was going to tell me to “tone it down.” Cancer can’t be toned down. • IF I were to get a book deal with a traditional publisher, it could take as long as 18 months for the actual book to come out. That delay was unacceptable to me. • IF I were to get a book deal with a traditional publisher, I would expect to make very little per book, virtually making the whole process a wash. Publishing is a business and you need to treat it as such. • I have spent my whole career in sales. I feel I’m very good at conveying the benefits my company represents to my potential customers. I certainly should be able to sell my own story to fellow cancer patients and their loved ones. • Books that are sold through the traditional channels in the publishing industry are sold as “returnable.” So at any given point, Barnes & Noble could ship back the 20,000 copies they ordered a year ago and expect a full refund! Even if they’re damaged. That business model simply doesn’t work for me. If I could leave you with a bit of advice, I’d start by saying, ‘Do your research.’ Make sure you understand the publishing industry. Make sure the messaging in your book resonates with your intended readers. Make sure your cover price meets certain rules of thumb so you don’t end up producing an unprofitable book. Have you ever thought about writing a book on your cancer experience? What encourages and discourages you about writing and publishing? Are there any additional questions you have for Donald about self-publishing? I’m a published writer and toyed with the idea of doing a book about my ongoing experience with lymphoma; specifically about coping with the details and incidentals that come with diagnosis and treatment. I decided, ultimately, to go in a different direction. Secondly, I feel that the Web is the first place most people go these days for information. So, I started my own blog. (lymphomamusings.blogspot.com) I don’t have a large readership by any means, but it’s slowly starting to grow. I’m satisfied with it for the time being. I, too, have had the “you should write a book” comment….frequently. I don’t know. I *have* been writing about my experiences with cancer (yeah, crappy first draft! ), but that is more for me. I’m not sure what i want to do with it yet. Thanks for the interesting topic and information! Do it on your own. It needs to be done. I remember when my best friend had cancer at 19. It was so unusual back then and noone really knew how to hellp her or what to say. The community is so important. I loved her but I had no idea what she was truly going through. It would have been great for her to have some resources to connect her with others who knew more of what her experience felt like. i wish you luck and look forward to reading future blogs. Thanks for all of your comments. Sue and Jen, I think you raise two great topics that I should include in the “Should You Write A Cancer Book” series. 1) Blogging: I think patients too often latch on to the idea of publishing a book without considering all of the benefits blogging has to offer. I’ve read both of your blogs and love them! 2) Profit: Industry statistics about non-fiction publishing and profit are hardly ever talked about, and mysterious information for first-time authors. I’d like to elaborate upon this for readers so they know what to expect when scheming for their first book. Thanks again for your ideas on this! I hope you are both feeling and doing well. I think cancer patients have the a unique gift to share their experiences in writing. There are simply too many blogs about it and the readership is low unless you’ve become a credible source and an enjoyable one too like Kairol. There are probably as many blogs as there are patients out there. I feel people would get much more out of a book than a blog b/c blogs tend to me very specific to a case or an experience. Books tell the whole story, from start to end. I loved Lance’s “it’s not about the bike” but would probably not follow it if it were a blog. So many things are in e-version that cancer deserves to be read in a book form. It’s more special. People also often start a blog and then give up on it which is frustrating for those who have followed it for a while. I am writing my experiences with Breast Cancer and Brain tumors (benign, thank God) and I hope to have this book published (self or otherwise) soon. I am nervous about the publishing part of the writing process more so that the actual book writing itself! Wish me good luck!! I’ve already “written the book” everyone insists I write; it’s my daily journals on Caring Bridge through a harrowing half year of treatment for Stage 3 esophageal cancer. I’ve chronicled every aspect of this journey in raw, authentic and very human words. CaringBridge is partnered with SharedBooks for those who want to have their journals made into actual hard-copy books. I just got mine last week & was so very impressed with it that I’m now wondering how to go about actually getting it out into the public. I don’t care about the money, I just want this 256-page experience with cancer to reach the largest audience possible!! My fantasy is that there’s a publisher somewhere who’ll look at the book as is, and be thrilled to reformat & edit it a bit for publication. I have no money for self-publishing but the fact that this book is already in near-perfect form should make it a no-brainer for someone. This blog details my son’s cancer journey. He was diagnosed with stage 4 Neuroblastoma age 4 in nov 2011. He is in remission and due to complete treatment in feb 2013. The blog is written as the journey has happened, so a rough and ready piece of literature! I started it to inform friends and family of what was happening, how I felt coping with the diagnosis, the health care system, being at home in between treatments etc. I have found that my friends and family read it and therefore when I meet them they know how I feel and where we are up to. Then I can give them more detail, but actually if I want to avoid talking about Harry’s cancer journey then I felt my friends were already aware of the issues that week. People say I should write a book. My blog is my diary and tracks our journey. If I ever wrote a book I would like to go more into detail about the effects cancer has on the whole family as well as the patient. As a parent of a young child with cancer, it is the parent who carries all the worry, is the advocate for the child’s welfare, negotiates the health and social care systems to get the best possible care and at the same time deals with grief. The grief that accompanies the loss of the fantasy, when a child is diagnosed wirh cancer. The loss of the planned future, the loss of doing everyday things others take for granted, the loss of routine as life is dictated by hospital stays and appointments. Learning to live a ‘new’ normal, to fit in as much fun too, to enable the child to still live life as far as possible, to be a child and not just a patient and very importantly too, to include siblings on the cancer journey! Parenting a child with cancer, takes parenting to a whole new level, one you can’t discuss readily with your peers. Hence the blogg! I was diagnosed with osteosarcoma at the age of 13,been through chemothrapy and surgery,the doctors has to amputated my left leg which the cancer cells spread to my lungs, I went through 9 surgeries it was not easy but am so grateful to say am 15 years and cancer free.to me I want to give all thanks to God because I believe he performed this miracle in my life, I would love to write a book and share my experience with those that are just starting the journey but I don’t know how to start. Thanks for writing your comment and giving us a peek into what you have been through. It is obvious how much you want to write and share your experience with others. You have motivated me to write a new post in response to your comment. It is called How do I start writing about my cancer experience? Have fun with your writing! I blogged about my cancer experience as well. I keep wanting to start it up again, but I can’t find a focus. I actually have thought about writing a book with my mom, a cancer survivor who nursed two of her kids through three cancer diagnoses. I just don’t know where to start! I am a 28 year breast cancer survivor, first diagnosed at age 36, having a recurrence at age 39 and then another in my 50′s. For the past 23 years I have owned and operated 3 companies, all in the breast cancer products & services industry. I am a BOC board certified post mastectomy fitter, manufacturer and retailer of after-breast-surgery products and most importantly a long term survivor. I believe I have a wealth of information and support to share with other women from the time they are diagnosed, as they travel on their treatment journey and then beyond. I would like to write a book focused on my personal experiences in addition to offering helpful resources I have discovered along the way, but I want it to be new, fresh and unlike the survivor stories that have been previously published. Any suggestions as to how I can research what readers would be most interested in that has not already been done?? I wrote a book about my cancer. Thanks for the info. I have had cancer for 7+ years off and on. It was taxing until I decided to write about it. I am a survivor and I think that what helped me was reading all the inspirational stories of real cancer survivors. Cancer is not my identity but a huge part of my life so I felt the need to share with all my friends. I will publish my 300+ page book some day and that too will be an accomplishment just like surviving cancer is. 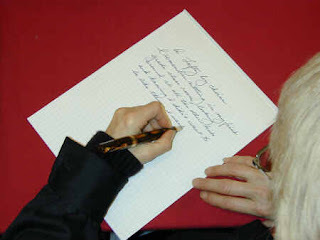 I encourage all of you to write as much as you can about your disease. And remember that you are strong; true empathy never sides with weakness! Very interested in publishing….but from the perspective of the child left behind. I lost both parents to cancer and feel the need to share. I have my thoughts screaming in my head….what about us? Those that are still here fighting the loss, the fear, the loneliness, what about us? I was diagnosed with Colon Cancer stage IV in 2015 and had massive tumor surgery. After that I refused the conventional treatments radiation and chemo as I had already done massive research into the negative impacts of both toxic therapies and decided to go natural. In Oct. 2015 I was diagnosed cancer free, as my natural ways obviously worked… Everybody who knew about my cancer journey told me to write a book. Which I did, it’s called “Victory Over Cancer Is a Decision!” as this is exactly what I believe and did. Overcoming cancer is an informed decision. Once people know that there are many alternative healthy ways to combat cancer, less and less people will chose chemo (at least I hope so). Right now I am faced with the complexities of self-publishing which is quite time consuming to figure out. Interestingly everybody who said I should write a book about my story is now refusing to read my book. It seems too scary for most people to confront. People often only look for quick solutions once cancer hits them and don’t want to change their self-deprecating life styles to prevent cancer in the first place. The quick solution if often a choice for a toxic immune destroying therapy and many people give in to the bullying of their oncologist and families who think there are no other ways to treat cancer. I see it as my mission to spread the word that the entire cancer industry is all about FEAR and chemo is a failure cure and causes additional cancers. Once people understand that the way towards non-toxic cures propagated in mainstream may open up.